Last Sunday I went bridesmaid dress shopping with for my friend Danielle’s wedding. Dani, Brittany (Danielle’s sister), and I are all bridesmaids, or I should I say I’m a bridesmaid, they are maid and matron of honor. The dress Dani will be wearing. The dress Brittany and I will be wearing. I love that Brittany and I (the bigs sisters of the Danielles) both chose the same dress. The rest of her bridal party is in Reno, so it will be interesting to see which dresses they choose. Sunday was also Mr. Big’s second birthday. 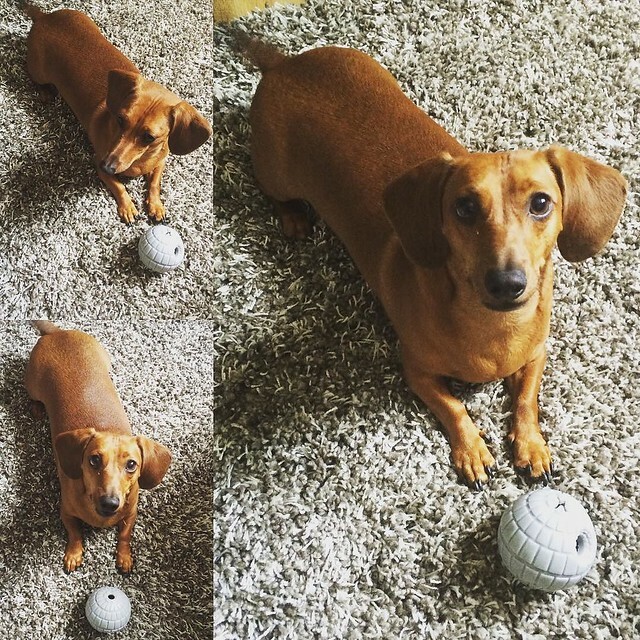 Dani got him a Death Star toy. My present to him was a teepee from Pipolli which he got early in August. Not too busy of a week but still a good one! I did a poster for Breast Cancer Awareness month and corresponding Facebook ads, put together a research survey on SurveyMonkey for a client, presented a design to a client, and went to a meeting for a new client project. I did some internal stuff too as well as working on my weekly blog post. Since it was the end of the month I got my Beauty Bag and Favorites posted. I also did my second week of Friday Finds in Web Design over at the Three29 blog.